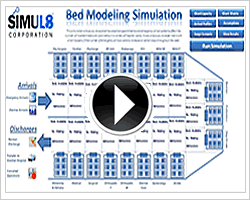 From product feature videos to the ability to test-drive SIMUL8 in the SimLab, the resources below will let you see SIMUL8 in action and learn more about the uses of simulation in healthcare. 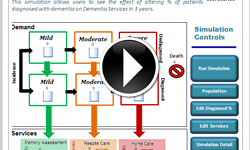 View recordings from our online healthcare workshops. From simulating patient safety to maximizing your Lean ROI, our workshops provide comprehensive discussion and research on the benefits of simulation in healthcare. South African charity Shout It Now used SIMUL8 to create a robust process that more than doubled the HIV patients treated per day. Introducing LeanHDX - Rodney Mullins from BJC HealthCare demonstrates how he used LeanHDX to consolidate scattered labs into one, helping to maximize efficiency and eliminate waste across their facility. What if you knew a bed crisis was going to happen before it happened? Could you do something to reduce its impact? This workshop explores the challenges in commissioning a healthcare organization to provide an integrated service for obesity, weight management, and treatment in Nottinghamshire County, UK. Memorial Health has successfully reduced the wait time for a CT scan by 30%, which has reduced length of stay, avoided a capital expenditure cost, and improved throughput in their Trauma Center. Robert Celeste, former Senior Director at GS1 US, explores how simulation was used to demonstrate the supply chain process to gain consensus on a process that would be feasible in the supply chain and meet the needs of State and Federal regulators. Welcome to The SIMUL8 SimLab, a toolkit of online simulations that allow you to experiment with your healthcare improvement ideas in a risk free environment. What if I introduced new treatment options - would I reduce waiting times? What if I reworked shift patterns - could I ensure quality of patient care? 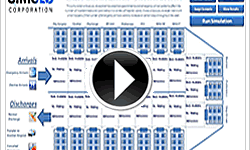 What if demand increased - can my system cope? 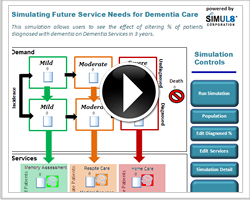 The simulations allow you to enter your own data and experiment with different scenarios to evaluate which option will work best for your health system.